10+ years designing, coding and managing the creation of great software. Overall product conception & management, programming for iOS and backend. When I first started using RealTalk, I remember that the experience of using the app had this charged and almost magical feeling to it. It was cool connecting with people I wouldn't otherwise meet, but the magical charge was about much more than that — it was about the way we were connecting. The kinds of questions we asked each other, and the genuine answers we offered, back and forth, led to this sense of real, deep, personal connection — I might not have known anything about the people I talked to, but somehow, I knew them. And they knew me. Genuine intimacy sprang up out of thin air over and over again, and it was awesome. In my opinion, that's the essence of what RealTalk did best: It was a space where people could easily and safely experience genuine connection and intimacy with new people, in a way that feels far less available in our daily lives. When we designed RealTalk, we went to great lengths to make it a place that you couldn't use for dating. For example, there were no filters for age or gender, and we would alternate between men and women when showing you new people. We wanted it to just be about connecting with other human beings and nothing else. We were very against it being a dating app. In early 2016, I hired a friend, Olivia Sinaiko, to work on community for RealTalk. Olivia had no tech or community background at all prior to working with us — we had reconnected at a ski house and I got great energy from her when telling her about the product. On a whim, I asked her to work on it with us. I was surprised when she said yes. By fall 2016, we were beginning to realize that RealTalk probably wouldn't find product market fit in its current incarnation, and Olivia began advocating for turning RealTalk into a dating app. She believed that dating was RealTalk's true destiny. I was extremely skeptical at first, but then I started thinking about my own experience with dating apps like Tinder and Bumble and how terrible it's been. Dating apps make me feel bad. They make me question my own self worth. They feel transactional. I don't feel like I'm talking to another human being — I feel like I'm playing a game where everyone loses. And the more I talk to people, the more I realize other people feel this way too. Very few people are stoked to get on Tinder, but many believe it's a necessary evil. RealTalk, on the other hand, felt great to use. The stakes felt much lower. Using the app, I genuinely felt like I was connecting with another human being. When I sent someone a message, it disappeared and I didn't have to think about whether they had responded yet or not. I always had something to say because everyone had a conversation starter. And with just a few seconds of video, I had a much better understanding of what others were like in person, versus the signal I get from a few text messages. Wouldn't it be great if online dating were more like this? Wouldn't it be great if instead of game playing, we're just talking to each other and feeling out the vibe? That would be a dating app I'd be excited to use. And that's what we built with Vibes. With Vibes, we took the best aspects of RealTalk (pixelated video messaging and conversation starters), and combined them with the best aspects of other dating apps (swiping lets you filter through a lot of people very quickly). I stopped working on Vibes in early 2018, but a small team continues to iterate on the product. Hacked together in a weekend. On RealTalk, I spoke to people from all over the country, each with a different background and set of experiences. Many of them were Trump supporters. It was very interesting to speak to them about why they planned to vote for Trump, and the experiences that led there. It gave me more empathy for their situation. I realized that if I had grown up in their shoes and experienced each moment just as they had, I too would be voting for Donald Trump. This is a powerful realization and one that I wanted to share with others. 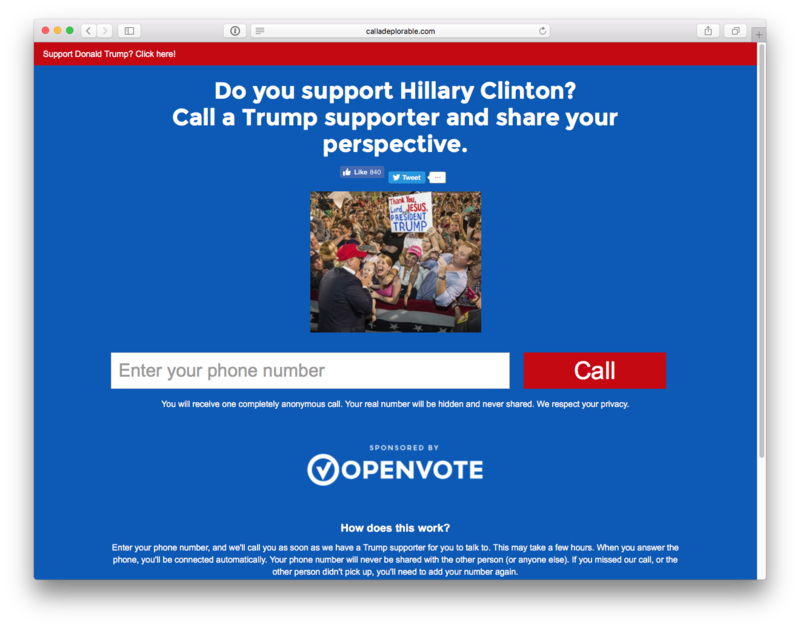 In fall 2016, weeks before the election, I built two sites with my friend Mark Kinsey: calladeplorable.com and callanelitist.com. 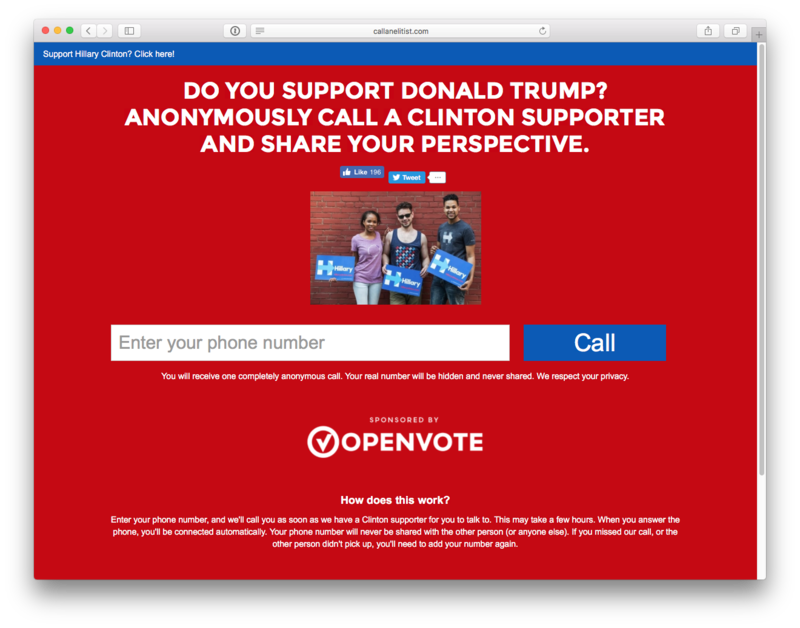 On each site, you would enter your phone number and be anonymously connected to a Trump or Clinton supporter, respectively. We facilitated over 500 calls, with most at least 5 minutes long (and many in the 20-30 minute range). Some of my Clinton supporting friends were surprised to learn that many Trump supporters had attended top schools and lived in metropolitan areas. It was an important reminder (especially for me) that stereotypes and preconceived notions only hold us back from connecting with other human beings. The more we can remove these barriers, the better off we'll be. On RealTalk Classic, many new users did not have friends using the app yet, so there was no way for them to understand its value when they signed up. To solve this, I added a default friend for every user called “Team Alexandre”. 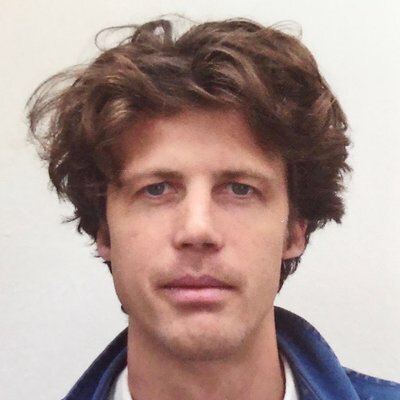 Team Alexandre sent you some initial tutorial messages, and if you sent him a message he would always respond back promptly, that way you could understand how the app works and you might invite some friends. That worked to a certain extent, but a more interesting behavior emerged: people started treating Team Alexandre like a real friend, talking to him about their day or how their life was going. This made me think that instead of being an app to talk to your IRL friends (we already have a lot of apps to do that), RealTalk should be an app to make new friends. We worked on RealTalk until the end of 2016 — though we had some traction, most of our power users would use the app for a month or so and then start to churn out. It was initially very interesting to talk to lots of new people, but over time it could become overwhelming. If you talked to enough people, you now have 20 conversations to keep going, and without the ability to meet them in person, there's no real end-game. RealTalk was an amazing product that I'm very proud to have worked on, but it didn't have a clear market or a strong need from users. At the end of the day, talking to strangers around the world is interesting but not a mandatory part of everyday life. In early 2015, I was feeling a lot of frustration with texting and the limited emotion it conveys. People wouldn't feel what I was saying. I wouldn't feel what they were saying. With text, we're forced to transcribe our feelings and emotions into carefully worded sentences and strategically placed emojis. Often we fall short. But what if we could just speak as we normally speak, using tone of voice and facial expressions to convey emotion, just as we have since before our first words? This was a problem I really connected with, so I took a break from WearToday and spent a few weeks building RealTalk, a very simple app to talk to your friends through video messages instead of text. The app was laid out like an iPhone home screen, with your friend's photos instead of apps. You could arrange them any way you want. To send a message, you just press and hold on who you want to talk to. In an attempt to make people more comfortable with video, you didn't actually see yourself while recording a message — you would instead see a photo of the friend you were talking to. Personally this made me feel less conscious, but in practice many people felt more self-concious because they were worried they didn't look good. I released RealTalk in mid-2015 and it got a small amount of traction. With texting such a big part of our lives, it was difficult to convince people to switch to a different medium. People saw the value of video, but in many cases it was inconvenient to send or view messages (like when you're in a loud place). This meant that you might use it for some of your communication with friends, but not all of it. If it wasn't constantly in your routine, you might fall out of the pattern of using it. Furthermore, if you were new to the app, you might not have friends using it, and it was hard to demonstrate the value of the app without any friends. It was an interesting experiment, but it had some major flaws. Luckily, some novel usage gave me new ideas to pursue with the next version of RealTalk. Built end-to-end. First iOS app. Overall conception, product design and coding for iOS and backend. I believe that getting dressed is for many people the most creative thing they do each day. You get to pick and choose from the things you already have in your closet and try to create something new and exciting. The result is an expression of how you feel and how you wish to present yourself to the world that day. WearToday makes it easy to catalogue and archive your daily outfits, sharing them with others in the process. There's even a closet that lets you see how many times you've worn a particular sweater, along with all the outfits you've worn it with. We have an active community of people who love being creative in what they wear and cheering each other on. WearToday was the first iPhone application I designed and built from the ground up. I started in mid-2012 and launched the first version at the beginning of 2014. I'm a Canadian living in San Francisco. Beyond software, I'm passionate about surfing and photography. You can find me on Instagram, Twitter and Facebook. For e-mail, try alexroche at gmail dot com.